all those important lessons that would otherwise be given only by one’s life’s experiences. Your father definitely ought to be honored every single day of his life and Father’s Day is just a special day that you must not miss. You must definitely throw a party for your father on the occasion. 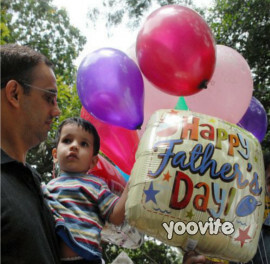 One of the best options to get ideas for celebrating Father’s Day in India is to refer books like “Just Like My Day” by Tricia Gardella, “A Perfect Father’s Day” by Eve Bunting, “Climbing Kansas Mountains” by George Shannon, “My Dad is Awesome” by Nick Butterworth and “Can I Help” by Marilyn Janovitz. Getting a gift for Dad is something that will be quite a tough task. There are so many special things that you could get him on his special day. One of the best ideas would be special key chains with a Father’s Day message. Another nice option would be to get a nice necktie if he wears them. If your dad is a really ardent cricket fan, then you could also think about getting him a personalized cricket cap. There are also some terrific t-shirts that could really impress your dad available in the market. After you get a nice gift for your dad, then you must think about nice activities that could keep him busy on the day. Fishing would be one of the best options if you can find a place to fish and some nice fishing gear. If your dad enjoys music, then you could plan a nice musical night somewhere. To make your dad feel pampered, you could also set up a nice spa day in a nice massage parlor. If your dad would simply like to spend some nice time with his family, then you could just have a good family dinner outside and also plan a movie together. If he is a car buff, then you could also go with him to a local car show. Just choose the best things that he would love to do. Even if you don’t do anything, your father will love you. But, just to make him feel extra special, all the effort is worth it. If you are pulling up a party for your father on the day, then you can use free online invitation tools like Yoovite to take make invitations easy.